It’s a new year and the last 3 weeks or so have been the hardest of my life. 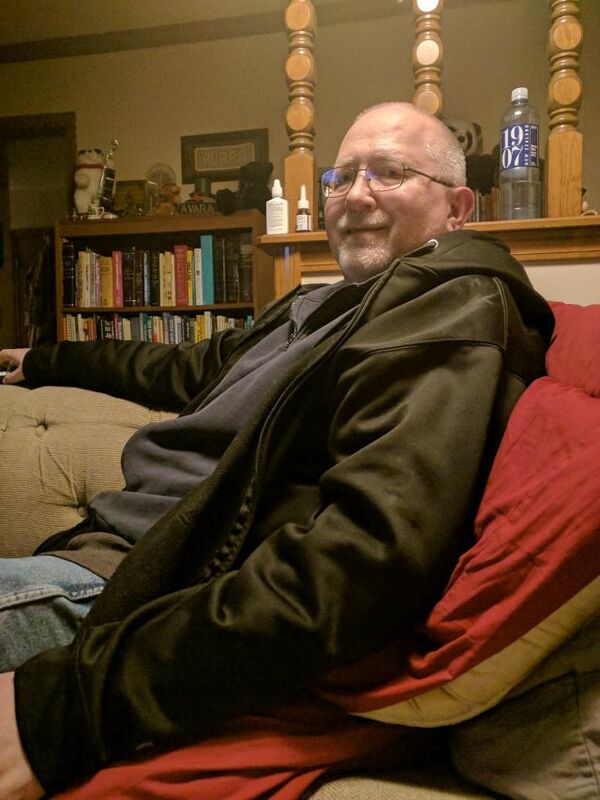 My husband, of 33 years, my love, lost his battle with depression on December 7th and has left me a widow. I’m now doing my best to pick up the pieces and survive. There are so many things I won’t get to do with him, including growing old together. Needless to say, I expect my blogging to be even more sporadic than it was this past year. I don’t think I’ve sewn a thing since I’ve gotten back from the retreat earlier this month. But I’ve been playing in my fabric. 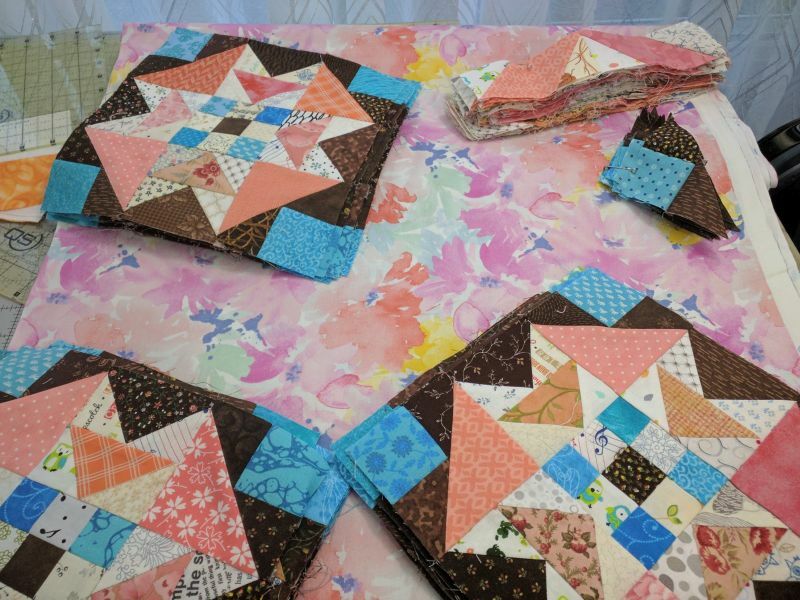 My general rule of thumb is I don’t start the new Bonnie Hunter/Quiltville mystery quilt if last year’s is still in progress. 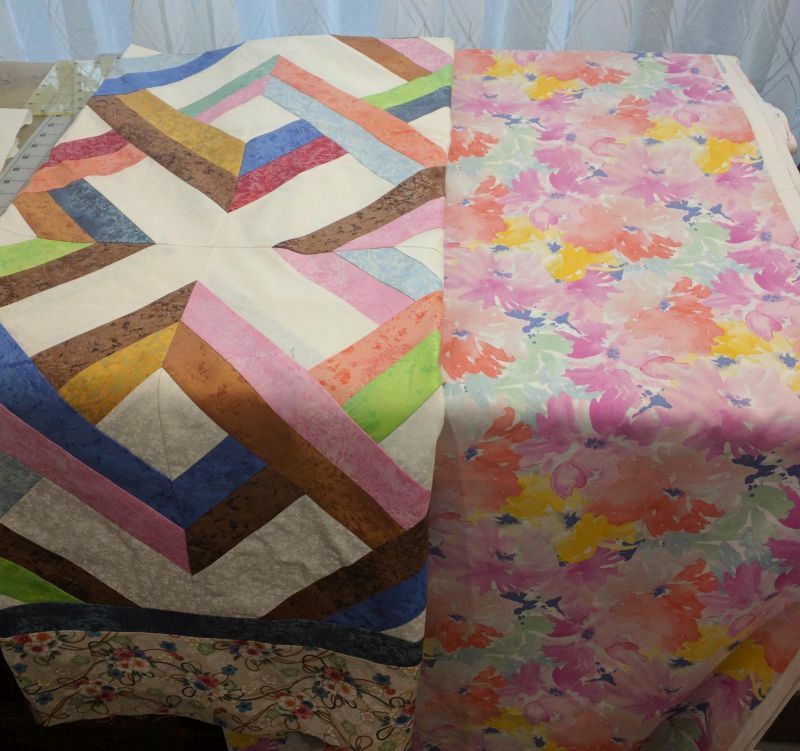 Well, I got the borders on the one from 3 years ago, completed the one from 2 years ago (OK, it still needs a label), and finished the top from last year’s mystery. There should be nothing stopping me from doing this year’s mystery. But before the retreat I just didn’t think I wanted to start another big quilt since I have several big quilts that I want to finish over the next few months. 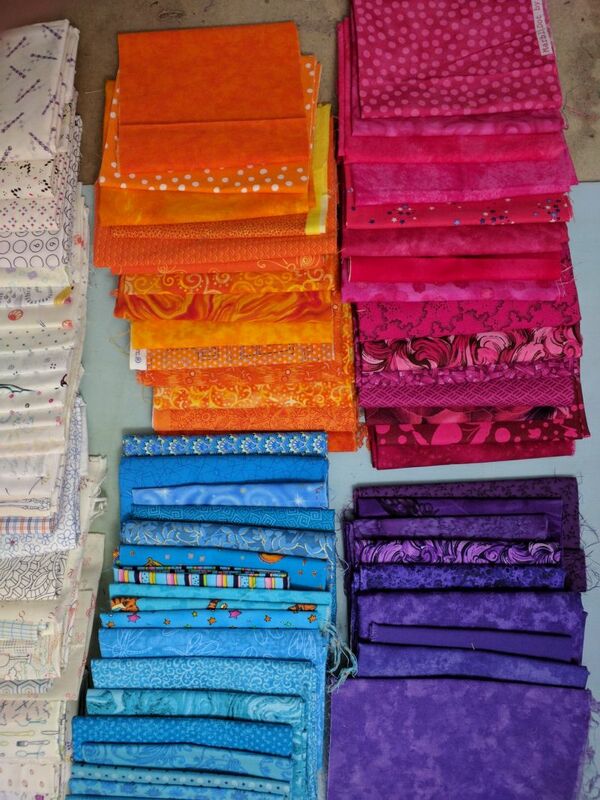 But when I got home, there I was pulling fabric from my stash. Pulling from my stash I ended up with turquoise for the blue, fuchsia for the red and at the moment I’m looking at purple for the green. But I have subsequently found my stash of lime green fabrics, so I might go with them if there is enough of them. Of course I could always go to the store, but I pretty much used up my fabric money on the road trip to Jackson back in June. For the past few weeks I’ve been folding and sorting all of the fabric which has collected around here. Anything bigger than 10″ x 12″ has been folded and put away — mostly sorted by color, but that’s still a work in progress. Smaller stuff has been tossed into bags to be cut up into my version of Bonnie’s Scrap Users System. I’m finally getting around to dealing with the scraps I’ve been given over the past few years, my own scraps and those scraps that I bought. What was I thinking! These bags are much fuller now. I think I’m down to maybe 3 boxes to be sorted, so I need to start cutting. But my pre-cut boxes are stuffed. So, I’ve stopped and had to sort through those boxes. This is the “shirt box” size. It was stuffed with 2-1/2″ strips. I pulled them all out, pressed them, rolled them up by color then bagged them. There’s plenty of room in the box now. My 2″ strip box, which is “shoe box” size has even more room. But then again I did pull out anything shorter than 12″ and tossed it into the sacks to be cut up into bricks and blocks. My brick and block boxes are also being sorted and straightened, although they won’t be put into bags. I will continue working through this process and hopefully do a bit of piecing over the next week. After Thanksgiving you’ll find me at my sewing machine. I have a Christmas wall hanging I need to finish, and who knows what else I’ll be working on. I need to find a couple of simple projects to take with me when I visit my sister-in-law. She’s learning to quilt. At this point I have no idea what I’m going to take. I suppose I need to give that a bit of thought as well. This past weekend I attended my guilds Fall retreat. It was held at the Unity Village Hotel and Conference Center here in the metro area. It was a beautiful facility and the food was fantastic. I’ve only been a member of the guild since June, so it was an opportunity to get to know the other members. Unlike other retreats I’ve gone to, I didn’t get my packing done until the morning I was to leave — was because it was only 15 minutes way? The good news is that I had everything I need, although in retrospect I wish I had taken my Sidewinder as I had to wind my bobbins twice to get the tension right. I was sewing on my Genie. 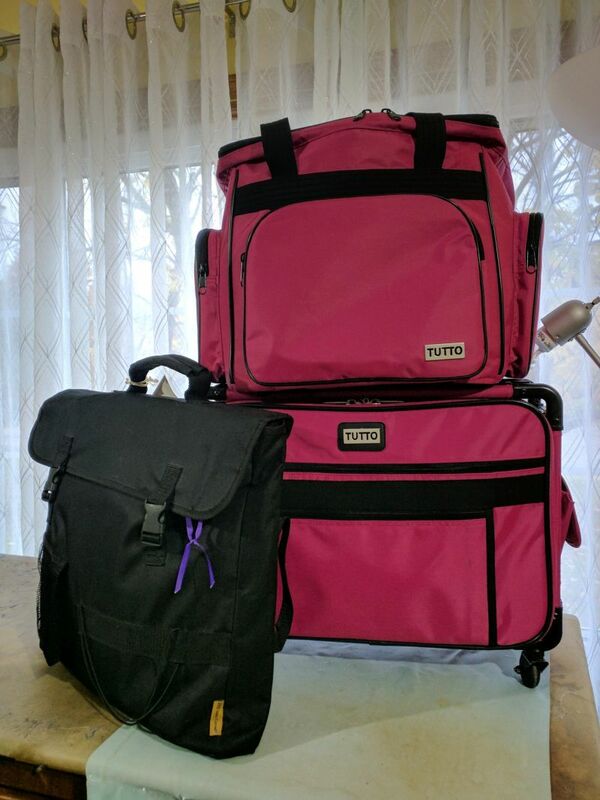 When I travel with sewing gear, my personal rule of thumb is that it must all fit in these three bags. The black bag holds my sewing machine extension, seat cushion, a 12 x 18 mat, a 12 x 12 rotating mat, and my larger rulers. The sewing machine bag has plenty of space since I purchased it to fit my big machine and now take my Genie. The square “serger” bag is my project bag. I’m so glad I was talked into buying it. It holds a ton of stuff. This weekend I had the following projects in it. In addition to the above, I had my Ott Light, my stuffed Bionic Gear bag, travel iron and a few other supplies/notions in the serger bag and there was room for more. But I refrained as the retreat was only from 10 AM Friday to 3 PM Sunday. I finished assembling my On Ringo Lake top. It looks wonky, but that’s the way it’s hanging on the wall and there is an air vent behind it. Next, I got the borders on Allietare. Then I pulled out Candy Sunflower Seeds. The center was done. I just needed to add the borders. 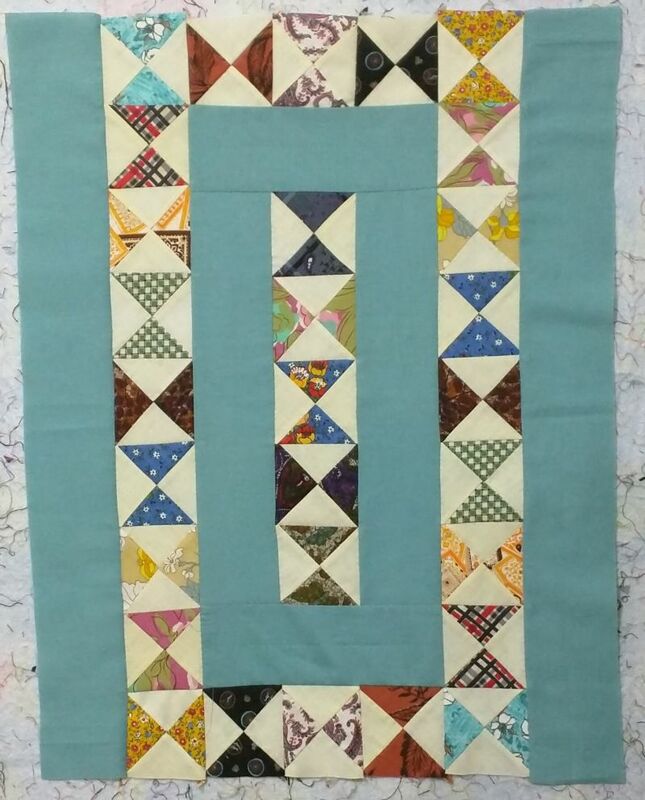 Most of the border was pieced. But I struggled turning the corner with my 4-patches, so I came up with another plan, which took all day and a 2 hour nap to implement. At this point it measures 51 x 70, so I’m calling it DONE. It also means I have some of that great brown print to use in another quilt. I then pulled out something almost mindless. My version of Now & Later. 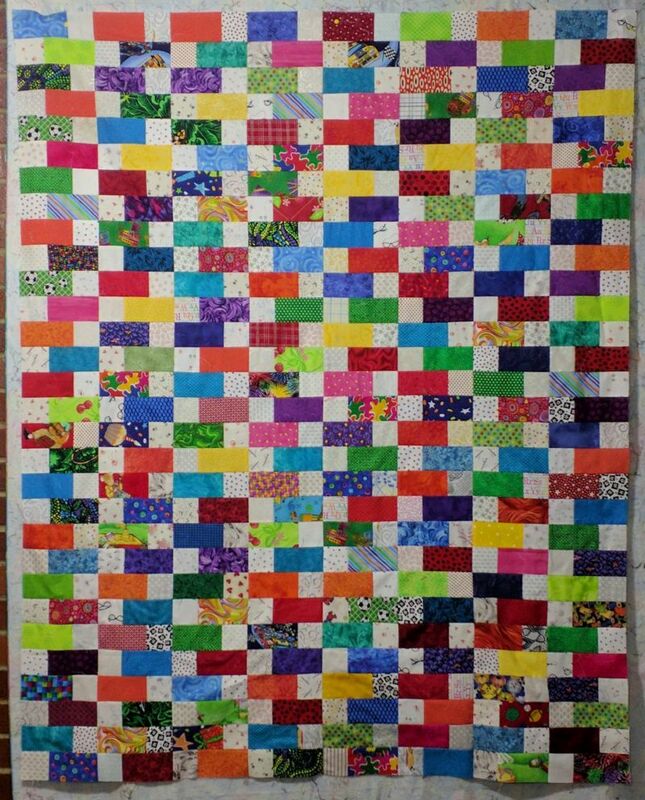 The squares were already sewn to the colored rectangles, so it just needed assembling. I got this far just as I needed to stop and pack up. This may actually be done, as it measures 48 x 60 and the border print that inspired the colors is way too busy for it. Of course the whole time I was sewing I was working on my postage stamp quilt. I sewed my 2-patches into 4-patches, then my 4-patches into 8-patches, then started making 16 patches. I think there are enough pieces there for 8 more blocks which will bring my total blocks to 32. I’m aiming for at least 72 blocks (64 x 72), so I’m not quite halfway there. Christmas Crazy Eights has been a long time UFO. 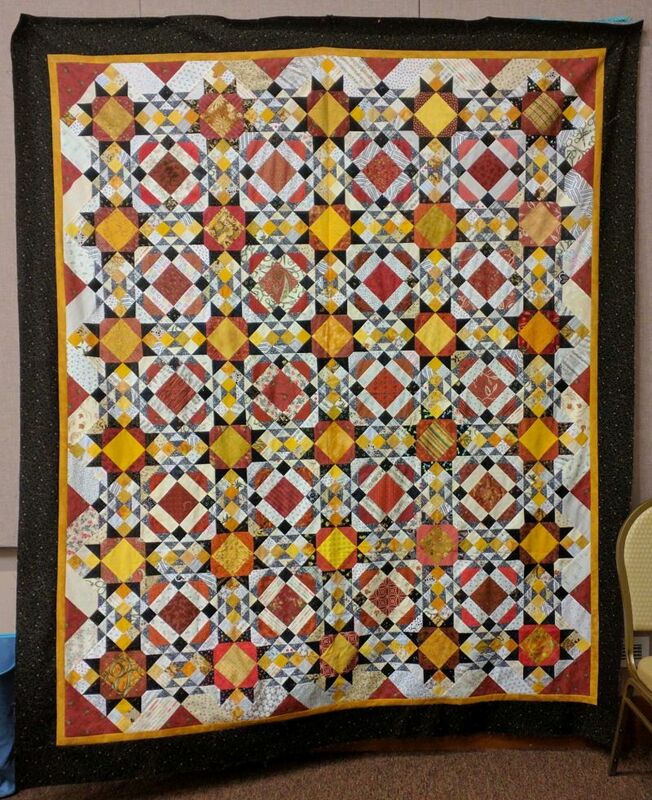 Years ago my friends and I went to Lexington Missouri to a quilt show. Afterwards we headed to Quilters’s Harvest in Higginsville where I fell love with these Christmas Fabrics. I couldn’t figure out what to make and had a limited budget, so someone suggested Crazy Eight. 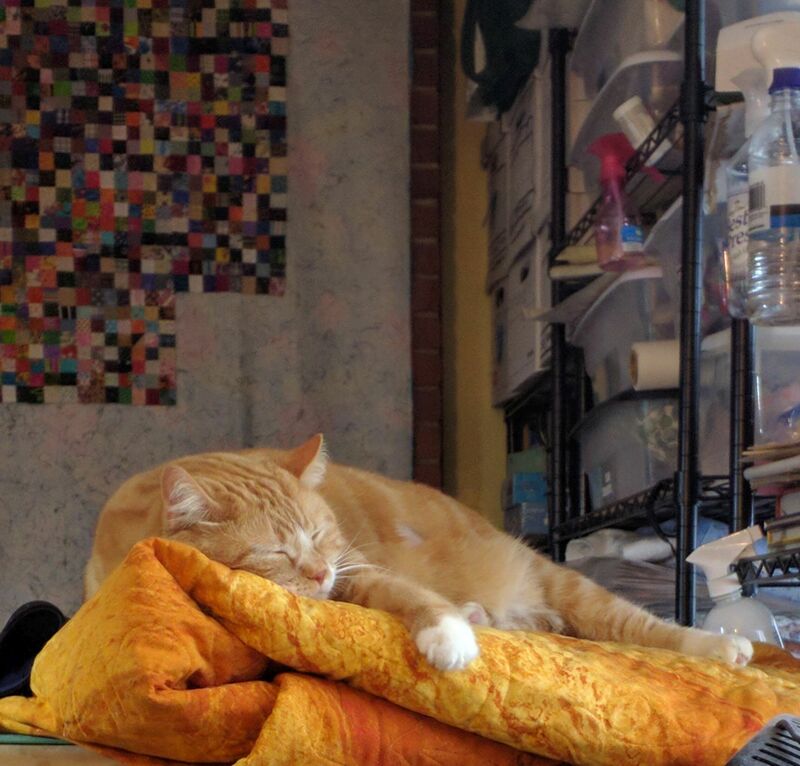 The quilt top was almost immediately made. But it sat waiting to be quilted. 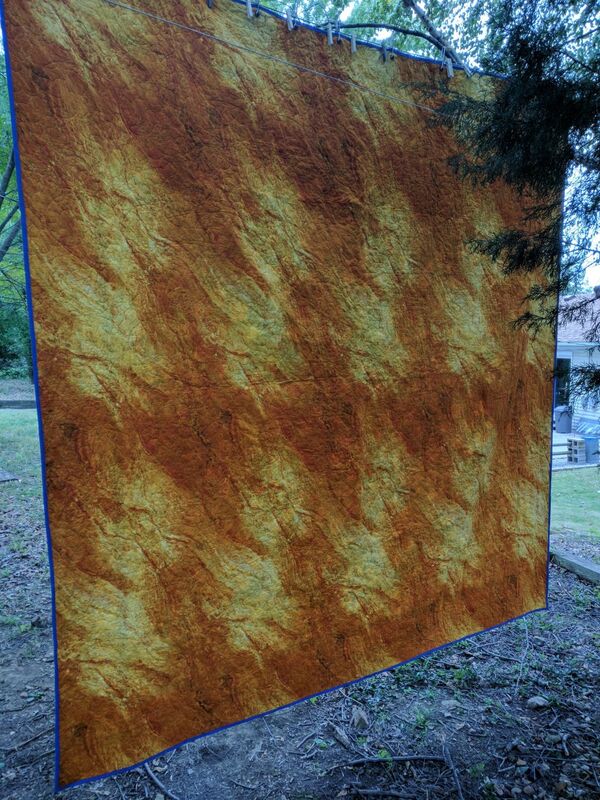 I pulled it out a year ago when I first started the quilting on En Provence, but never got to it. 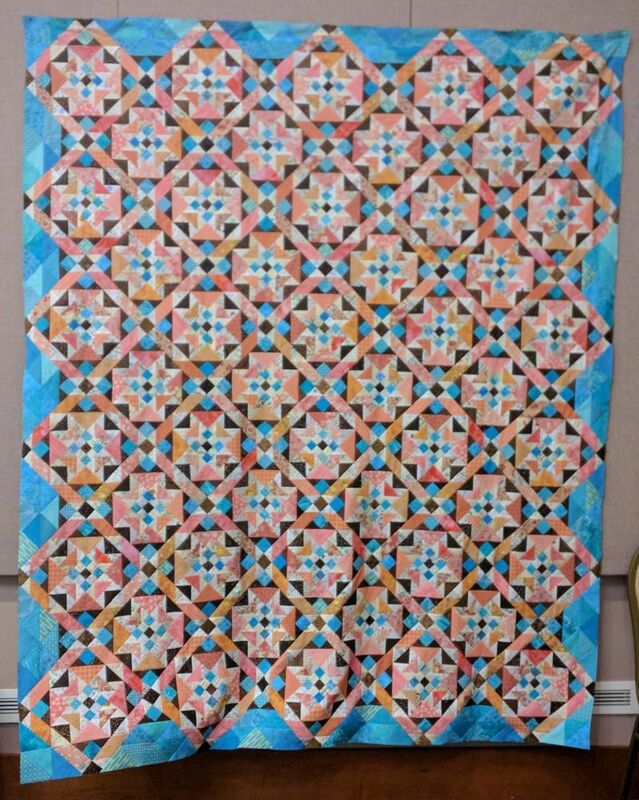 I finally quilted it in time to enter into the quilt show. 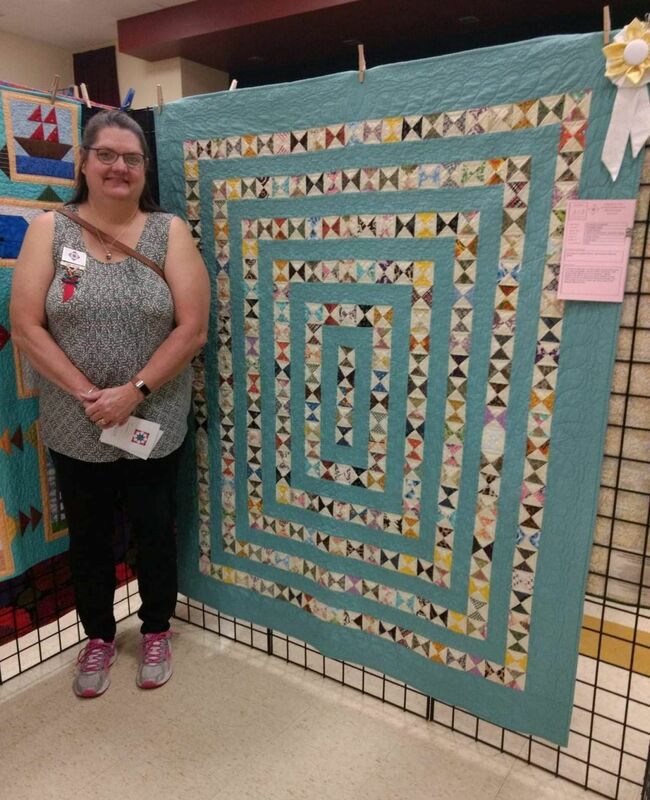 The guild quilt show was the last weekend in September. 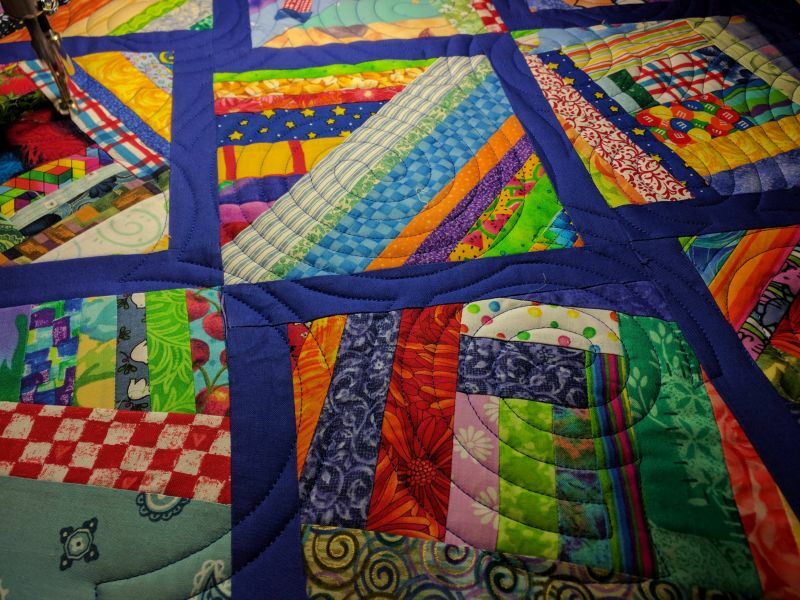 Prior to the show, a guild committee selected the Best of Theme Quilts. 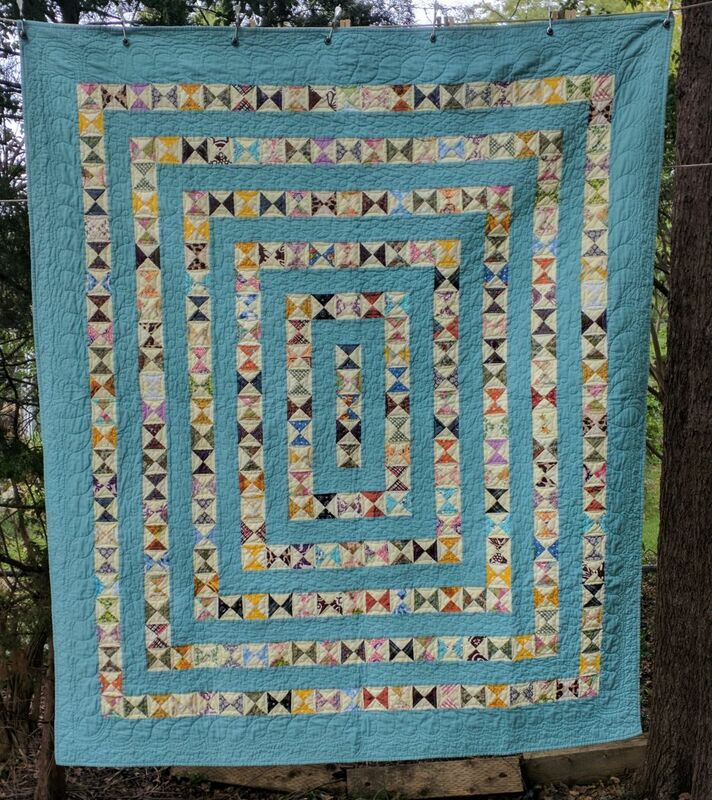 As mentioned previously my quilt Grandma’s Hourglasses placed 3rd. That’s the yellow ribbon on the right. Visitors to the show got to vote for their favorite quilt in one of 7 categories. I had quilts/projects in 5 of the categories. 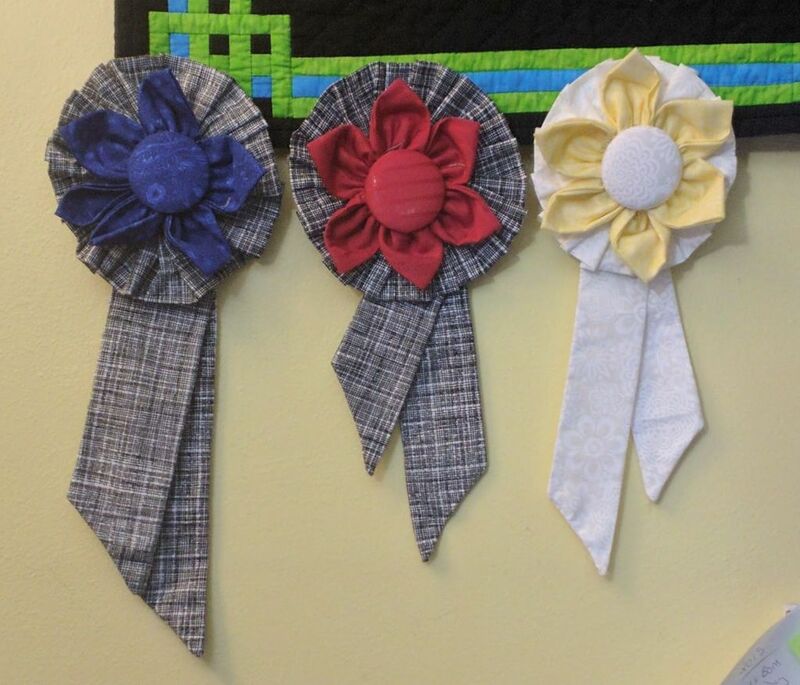 Two of my previously blogged about quilts/projects won viewers choice ribbons. Gift Wrapped placed 2nd (red) in Original Concept/Design. 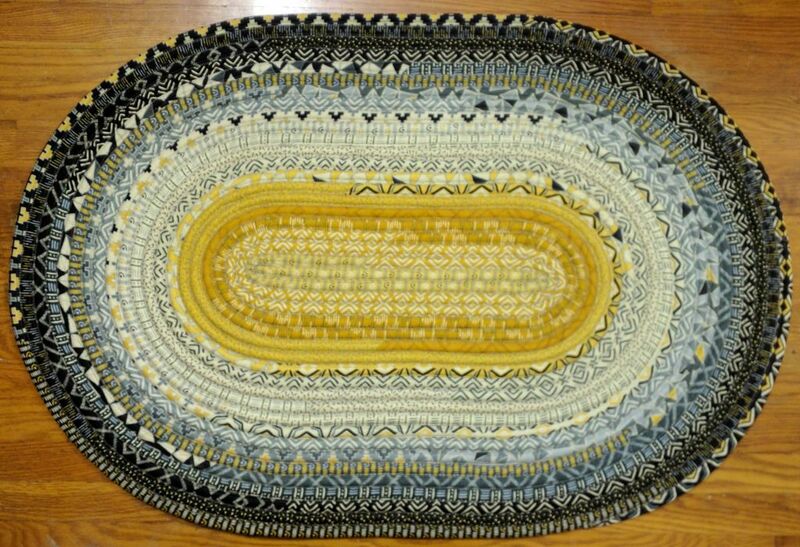 My jelly roll rug placed 1st (blue) in the Miscellaneous category. I have two more finishes I need to post about soon, so stay tuned. 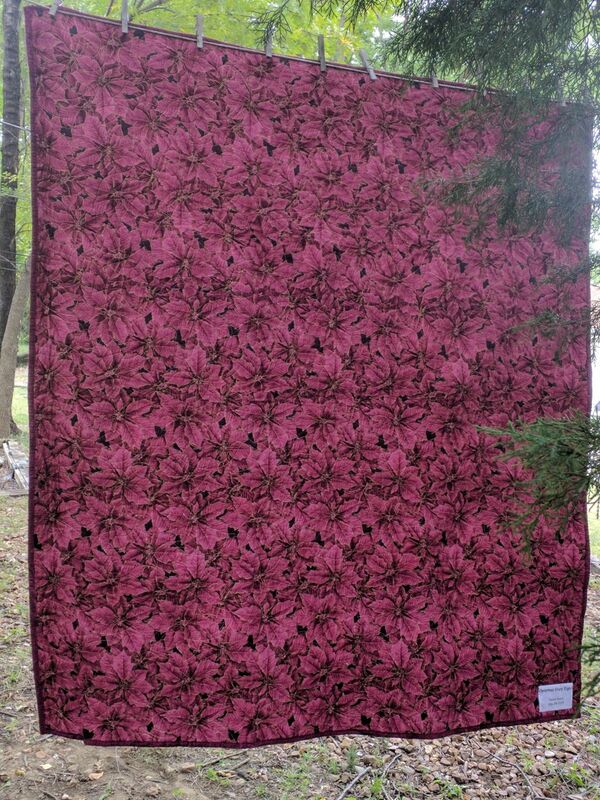 In all of the hustle and bustle of getting ready for the quilt show, I didn’t get all of my finishes posted. 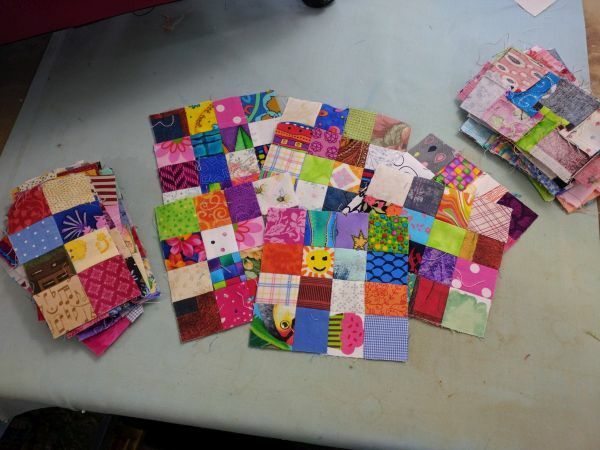 Since the show, I’ve been piecing up a storm as well, resulting in limited blogging as well. Hopefully over the next couple of days I’ll get caught up. 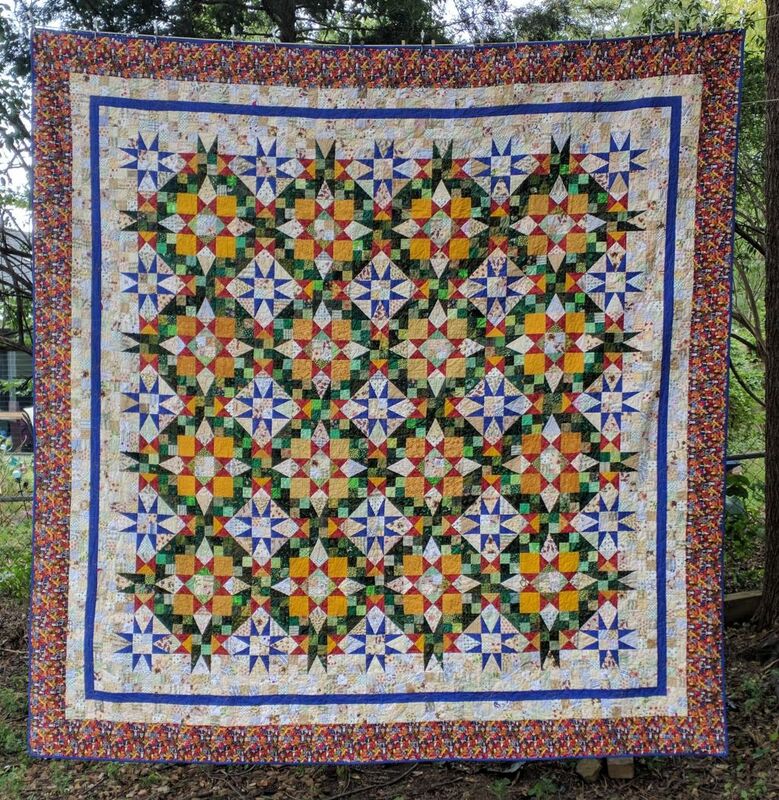 En Provence was the Winter 2016 Quiltville Mystery Quilt. I did fairly well keeping up with the clues finishing the top in February 2017. I did add extra borders so make it larger. On a roll, I promptly went out and purchased the batting and backing for the quilt, but then I didn’t get in to quilt it until after Thanksgiving. Did I mention this is a big quilt? 108 inches square. I did not get it finished in the time I had available to me. I pulled it off the frame tossed it in the back of my car where it road around for a few weeks before I brought it in side, tossing it on my ironing board. It became Butterscotch’s favorite spot. Somewhere along the way she threw a hairball up on the quilt. Yuk. Eventually I moved the quilt. It resided in the 2nd bedroom, the living room and our bedroom before it made it back to the sewing room. Then when my sister got her long arm quilting machine, I spent about 2 weeks ripping out the quilting I had done. Butterscotch “helped” me. Eventually I got over to my sister’s and got it quilted. I had lots of help from Butterscotch again putting the binding on. But eventually I got it done and was able to hang it to take pictures. I needed an extra wide backing, so picked this because of the color. I don’t think I really saw it until it was hanging. On my list to do is make some pillow cases. I have a bit of the border fabric, some of the backing, the blue I used for binding and some of the red. I don’t think all of the cases will be exactly alike, but that will be OK. 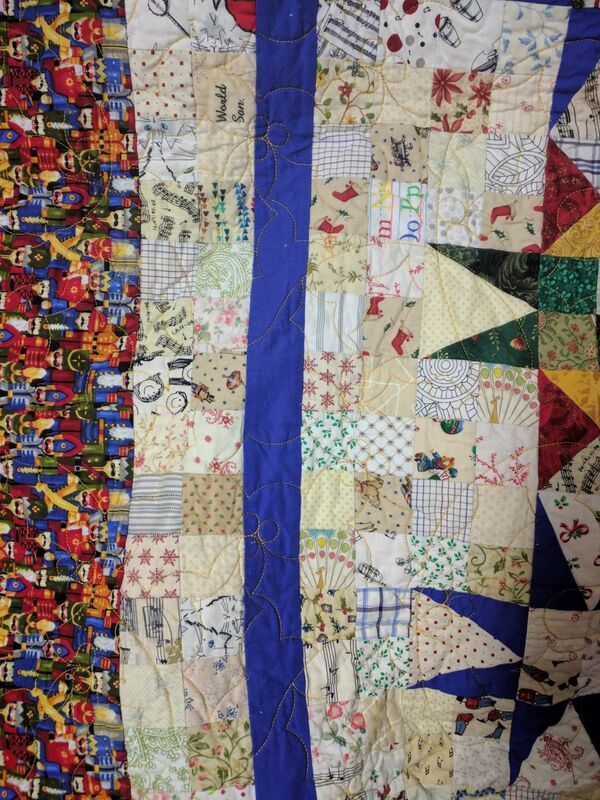 Here is a bit of the quilting detail. I used a holly E2E design that was pre-loaded on the computer, so I don’t know the name of the design. Buttercup Glide thread was used in the needle and bobbin. The batting is Hobb’s Bleached Tuscany 100% Cotton. 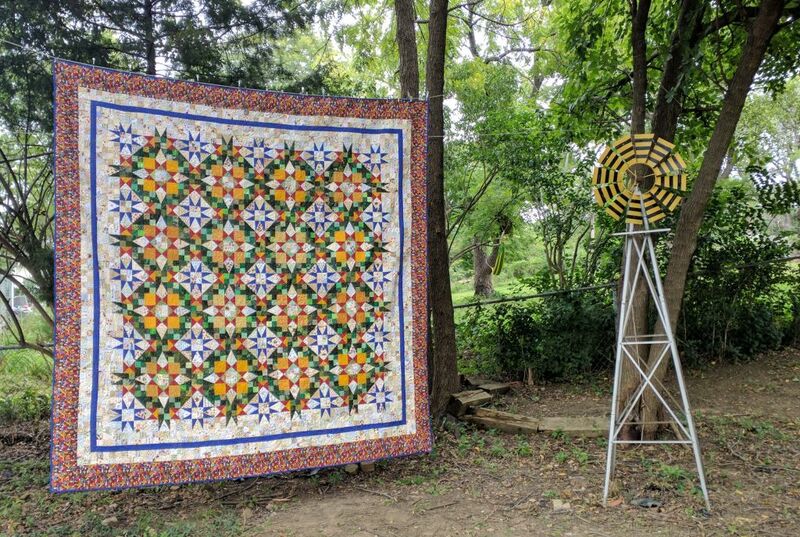 The final size after quilting and washing is about 104 inches. 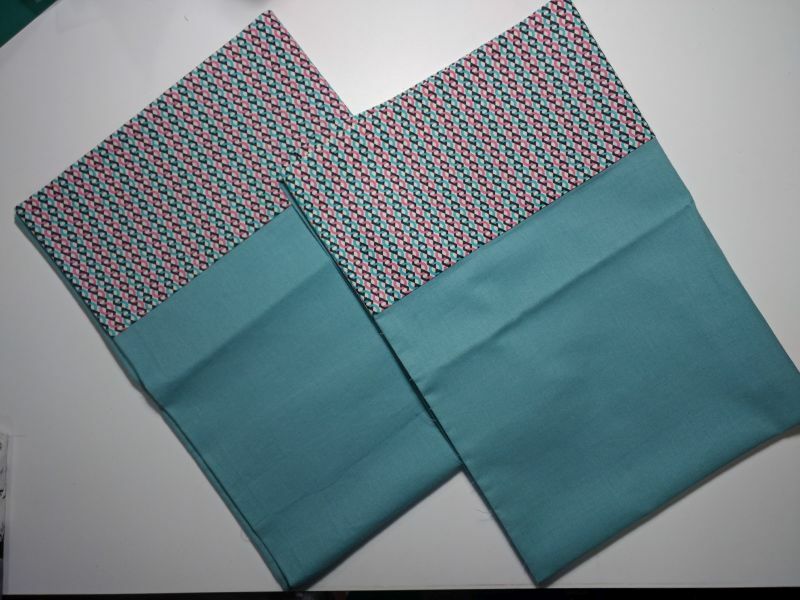 The more I thought about it the more I decided I needed/wanted more of the turquoise fabric for my JT2 quilt. $3 a yard is a great price and its on clearance so I if I didn’t get it now, I wouldn’t be able to get it later. I bought the rest of the bolt (it was in 2 pieces). I’m confident that I have enough to finish the quilt top and whatever border I end up putting on it. So much that I took the smaller piece and put it with my On Ringo Lake for the setting triangles. Since I was there, I browsed the clearance rack to see if there was anything I couldn’t leave behind. I found this abstract floral that I think will be a great backing for my Fairy Frost Sunset quilt. I plan to bind this in the denim blue of the inner border. After I got home I wondered how it would work with my On Ringo Lake. It would be OK, but given it’s not a top yet and only OK, I did not go back to get more. 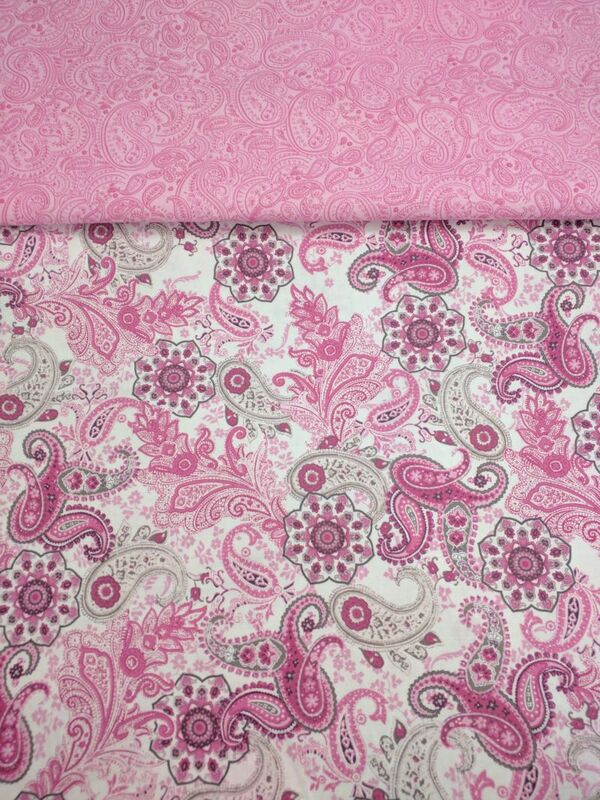 My speculative purchase was these two paisleys. I couldn’t decide between 2 or 3 yards of the pink and white, so took the rest of the bolt which was a tad over 5 yards. 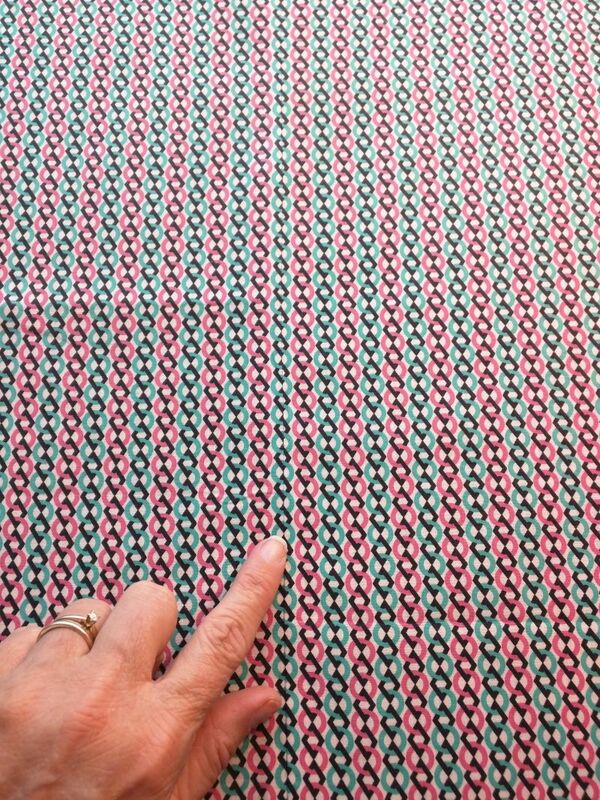 I did show restraint only only purchased 2 yards of the pink on pink. Again all $3/yard. My final purchase which was NOT on clearance was a yard of a lavender which I will use for the binding on the quilt I’ve been working on this weekend. 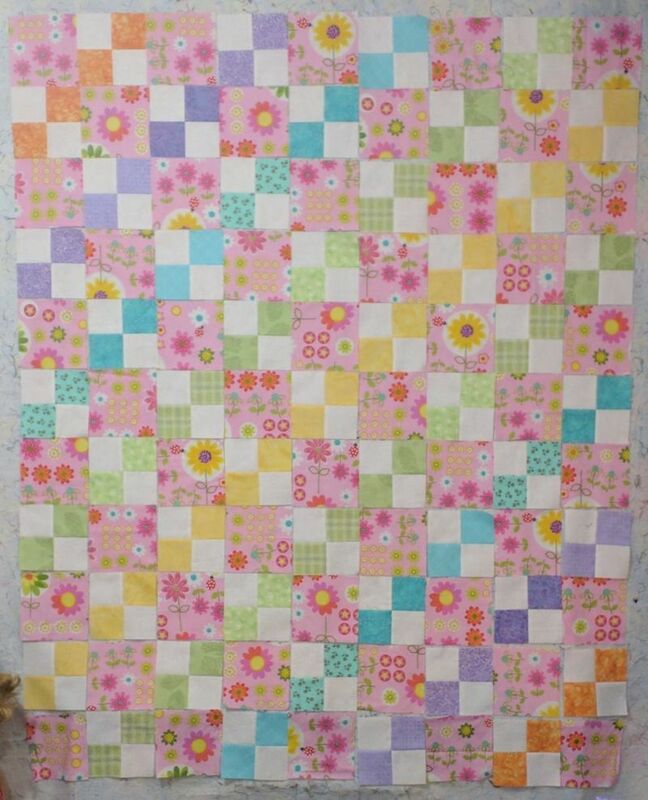 I’m calling it Daisy Dance since that’s the name of the pink floral fabric which was the inspiration of the quilt. 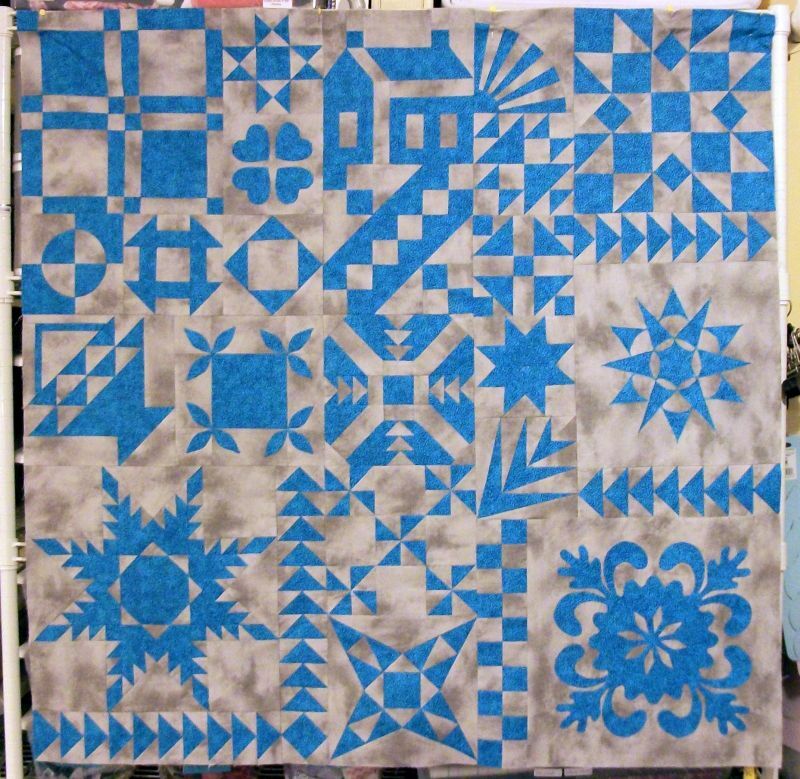 Here’s a picture of it up on the design wall prior to sewing the blocks together. It’s based on the Quiltville pattern I-Spy a 4-Patch. I have the top finished and it is basted ready for me to do some simple quilting on it. I found something to use for the backing in my stash. 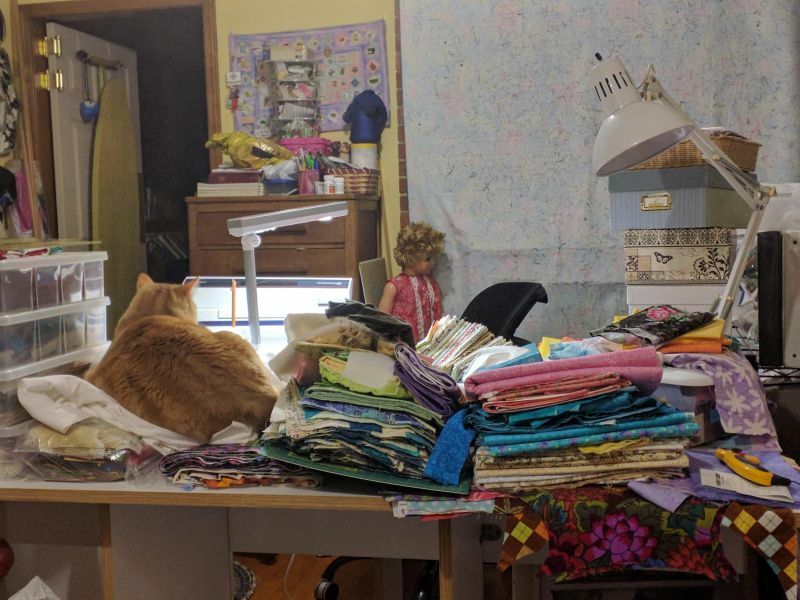 Now to clean off my sewing table. 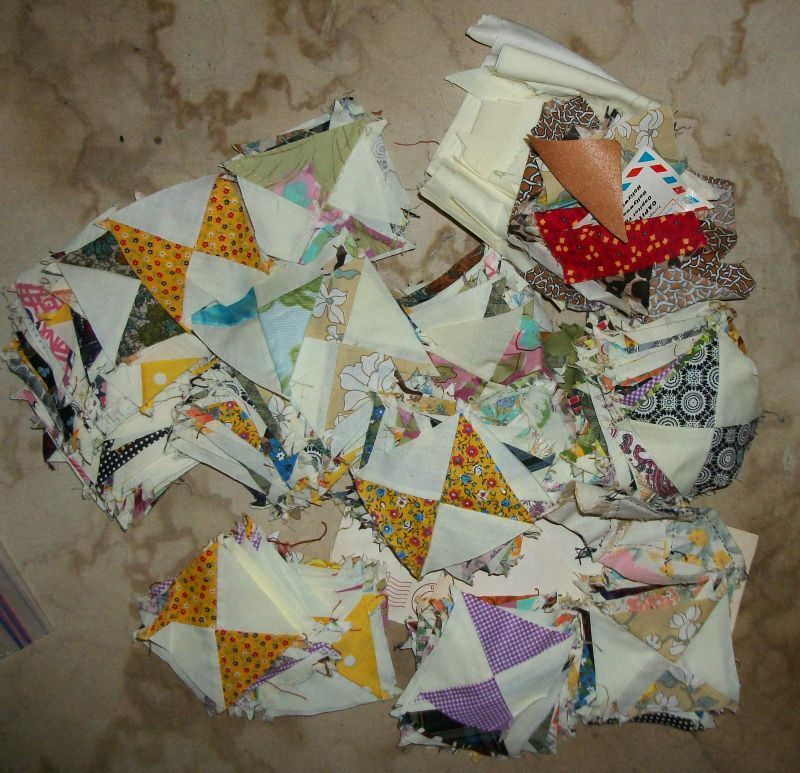 There is no way I can quilt, or put binding on a quilt with it in this condition. Way back in January 2012, I started Just Takes Two. It was a BOM by Sentimental Stitches. The pattern is now available for purchase HERE. 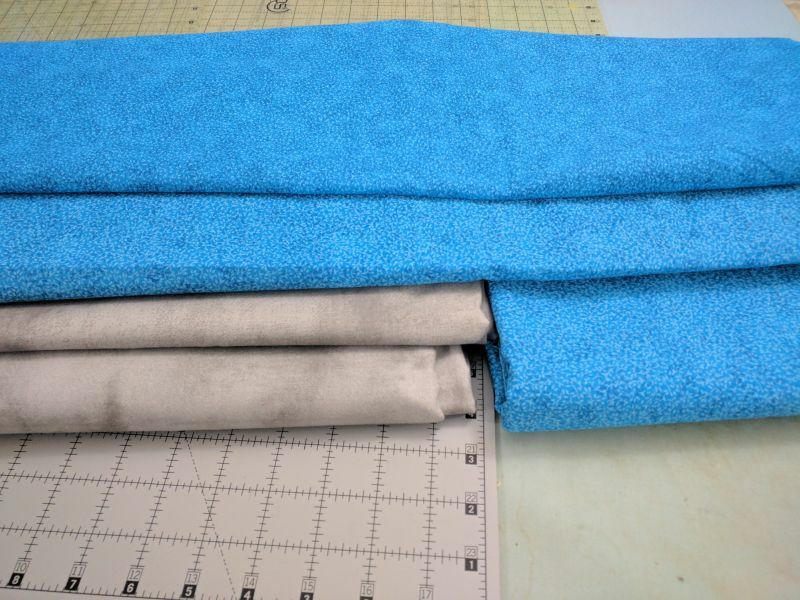 Anyway, I did not purchase the recommended quantity of fabrics for a couple of reasons: 1 – would I stick with the project and 2 – the fabrics I picked were “basics” on the calico wall at Hobby Lobby. As to stick with the project — well, not really – the last time I stitched on this was in January 2013. But I want to have it finished by this time next year, so there is hope. 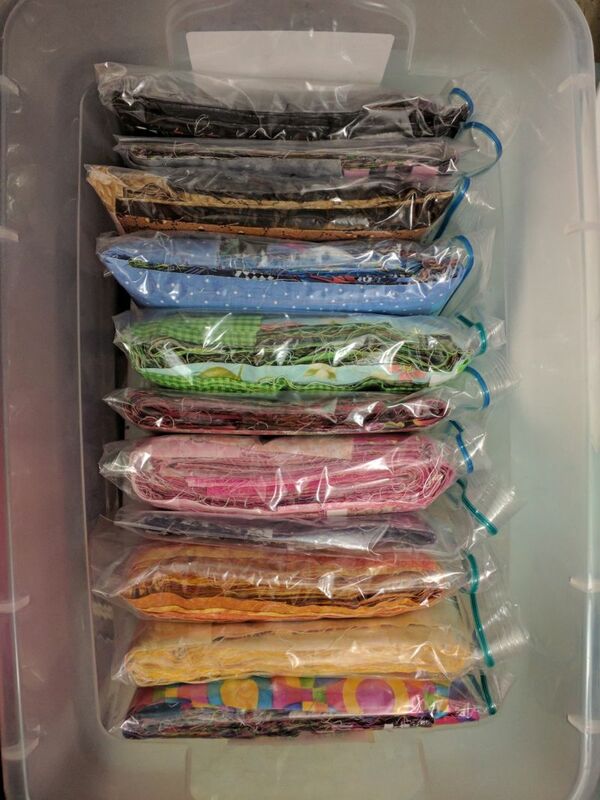 As for the fabrics being available, I went back in May 2012 and bought a few more yards and periodically over the years checked to see if the fabrics were still available and they were, so I wasn’t worried. Until now. 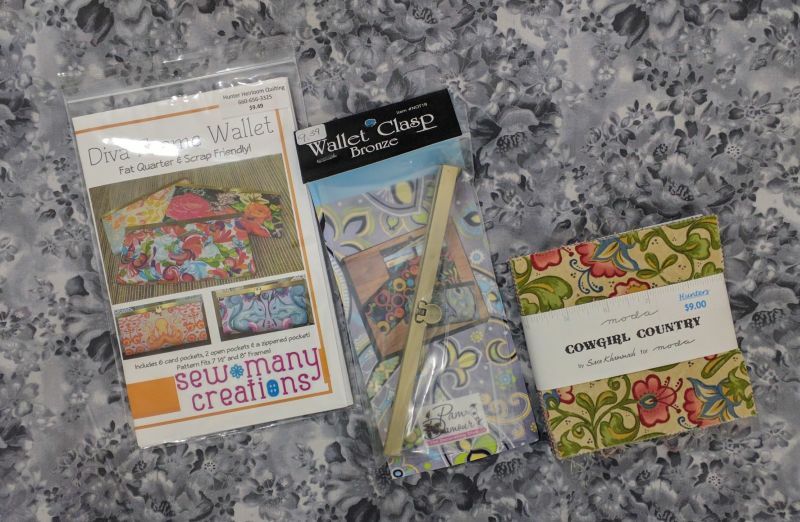 Last week on my way back from Hunter’s Fabrics in Centerview and their Fabricpalooza IV sale, I stopped in at Hobby Lobby. I found the gray fabric, but there was no turquoise to be had. OH NO! Sky blue is the Crayon color. 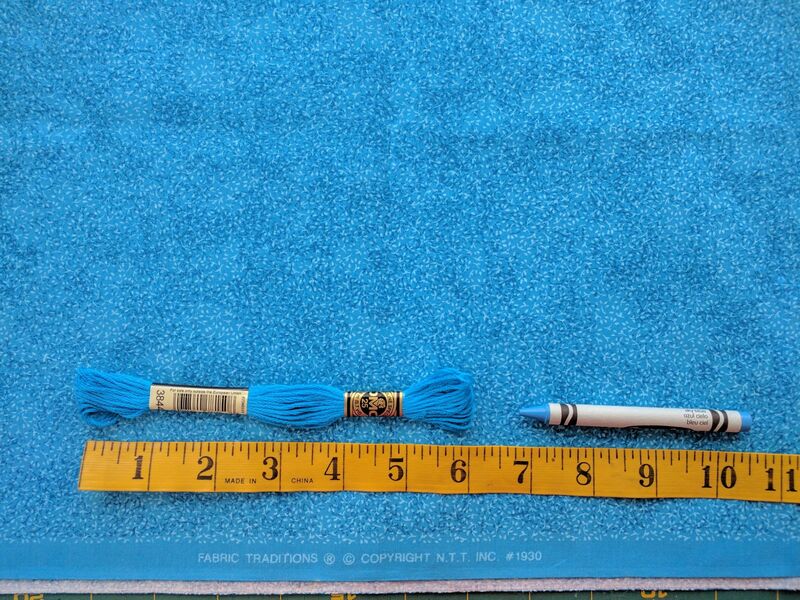 The DMC floss is # 3844 — but given the floss was bought in 2012, there is no guarantee the color is the same now. After work I ran by the local Hobby Lobby and discovered they were putting out clearance fabric for $3/yard. Perched on top of the basket was a bolt of my fabric! I bought 4 yards. I may be going back in the morning for the rest of it if it works with my On Ringo Lake — but I’ve got to locate it! I apparently moved that bag. While I was there I bought the rest of the gray fabric they had (I still want/need 2 more yards) and picked up some bright white — which is what my original excuse to go to Hobby Lobby was. 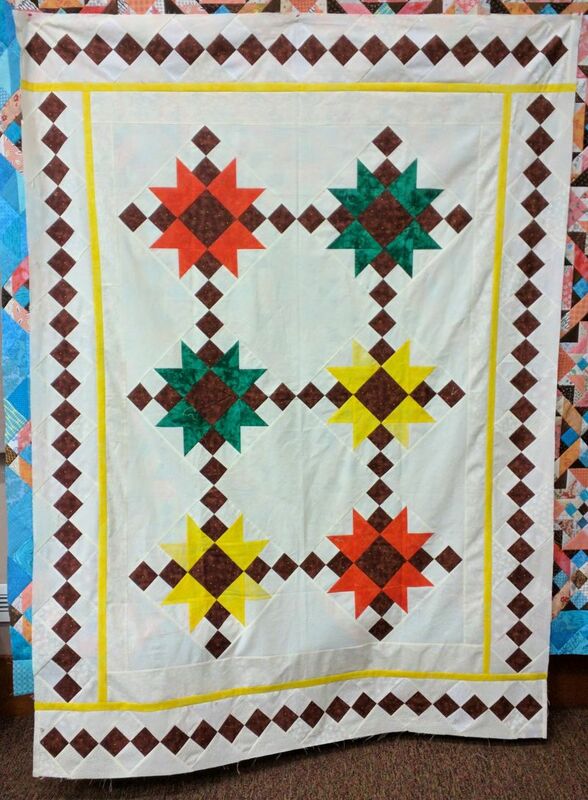 Hope to be able to show that quilt tomorrow. It was a busy weekend, starting Thursday. The end of September the city was working on the sewers in front of our house — specifically along the driveway. They tore it up and were supposed to come out and replace the section. But before they could get here, the rain came. 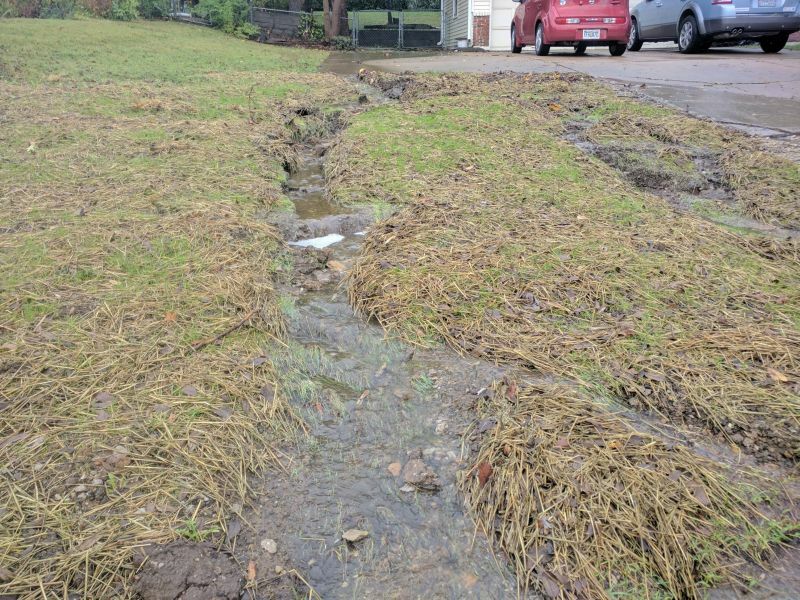 It rained and rained. 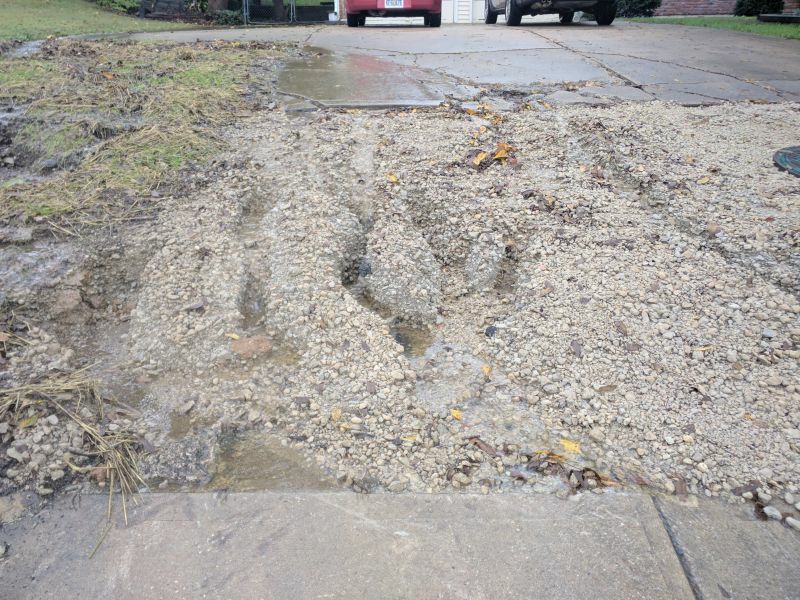 So not only did the gravel wash out, the turned over dirt between the driveways washed out as well. 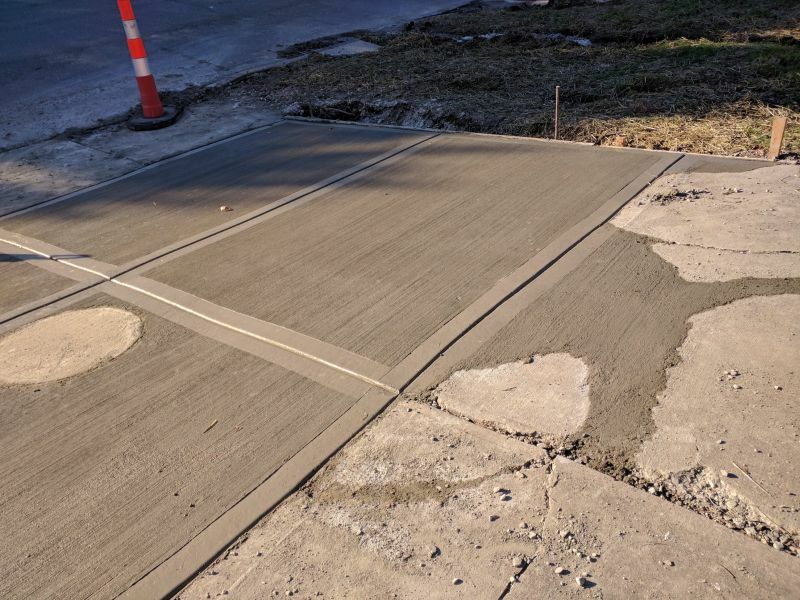 Then on Thursday it stopped raining, so the driveway got paved. Of course this necessitates us parking around the corner. Friday night my husband and hiked out and went to dinner (have you seen the value of the 55+ menu at Denny’s? ), then drove out to my sister’s so I could quilt. 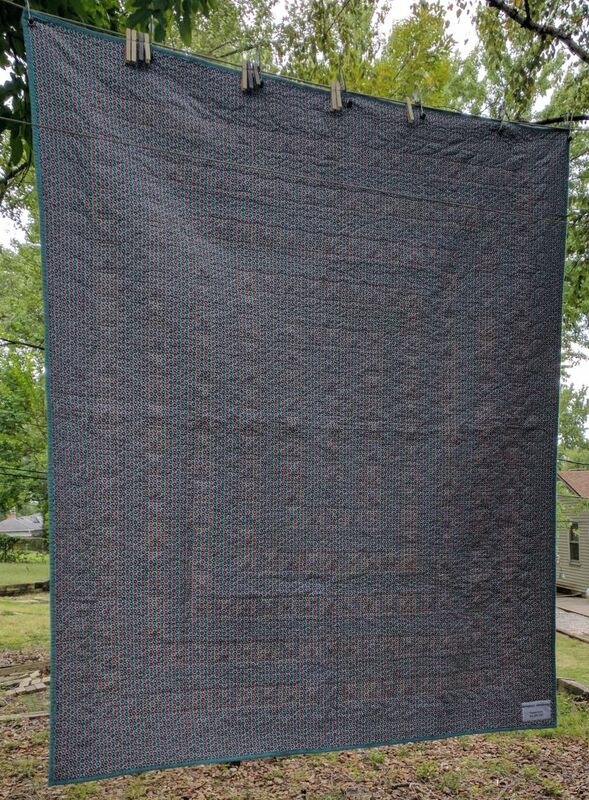 Hubby worked on his computer and I quilted the string quilt. I used the E2E design Overlapping Crop Circles. It was midnight before we got home. Needless to say I decided NOT to be at Hunter’s Heirloom Quilting when the doors opened for their big sale. On the list was a roll of batting, 8 or 9 cones of thread, bobbins, at least one backing, maybe some orange and yellow fabric for pillowcases, and a couple of Christmas FQs. No pictures of the batting, thread (9 cones) or bobbins. 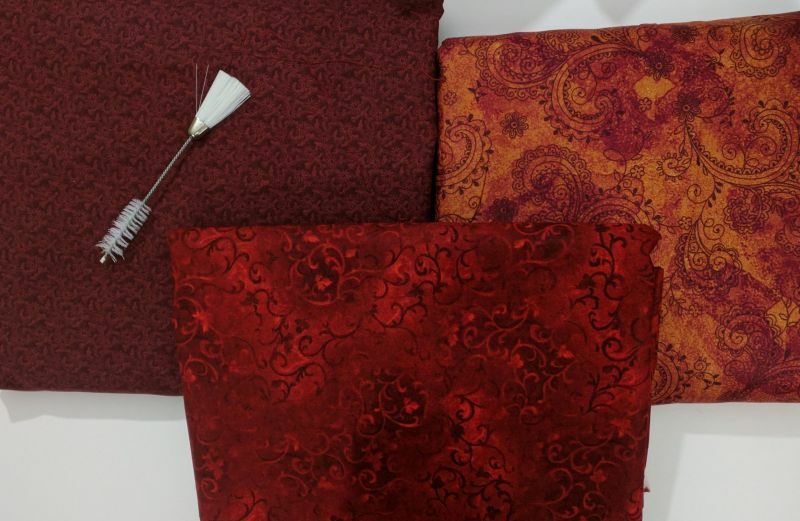 The first time I went through the line I picked up 3 backings – the burgundy Kansas Troubles fabric is for the Alphabet BOM; the orange/pink paisley is for Allietare; the red scroll is for the 2011 retreat mystery quilt — it’s the only one which is a complete top! I have one of those brushes, but I want to put one in my travel kit. 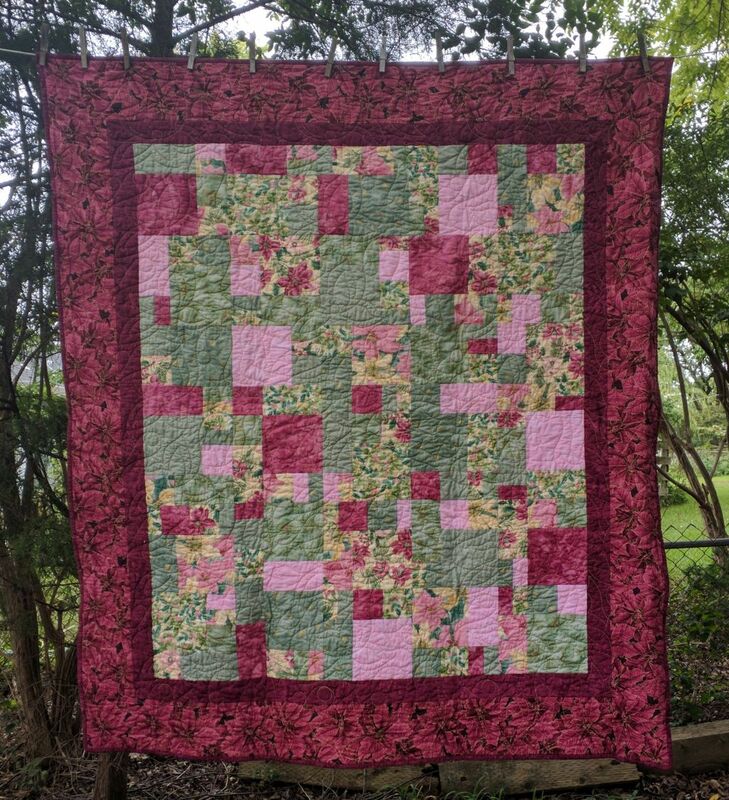 Earlier in the week I ordered a gray backing for the larger black and white 4-patch stacked posies quilt but received the wrong thing (a gorgeous pink!). 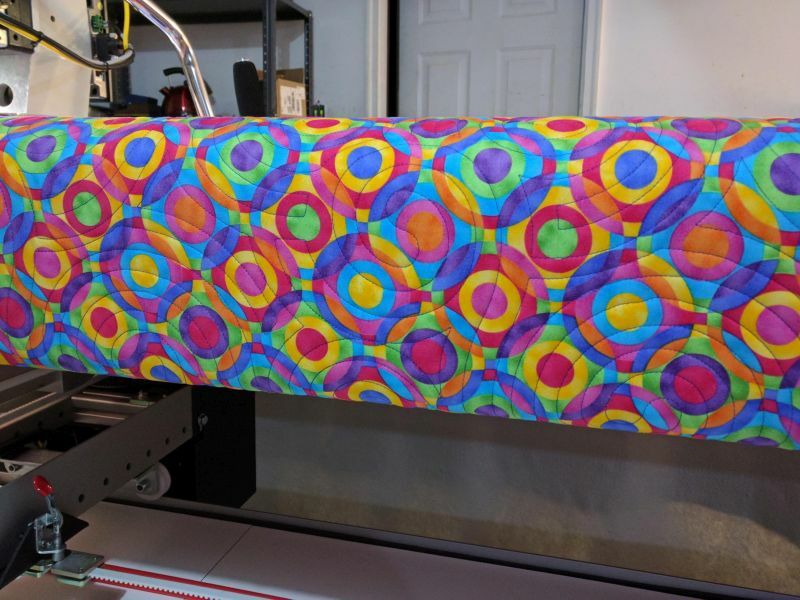 The correct backing was in route, but did not arrive on Saturday, so my husband suggested I get one since I was planning on quilting it when I got home. So, a second trip through the line was made. I found this gray backing, which I think works better, a wallet pattern and clasp, and a charm pack with the intention of finding the matching layer cake. 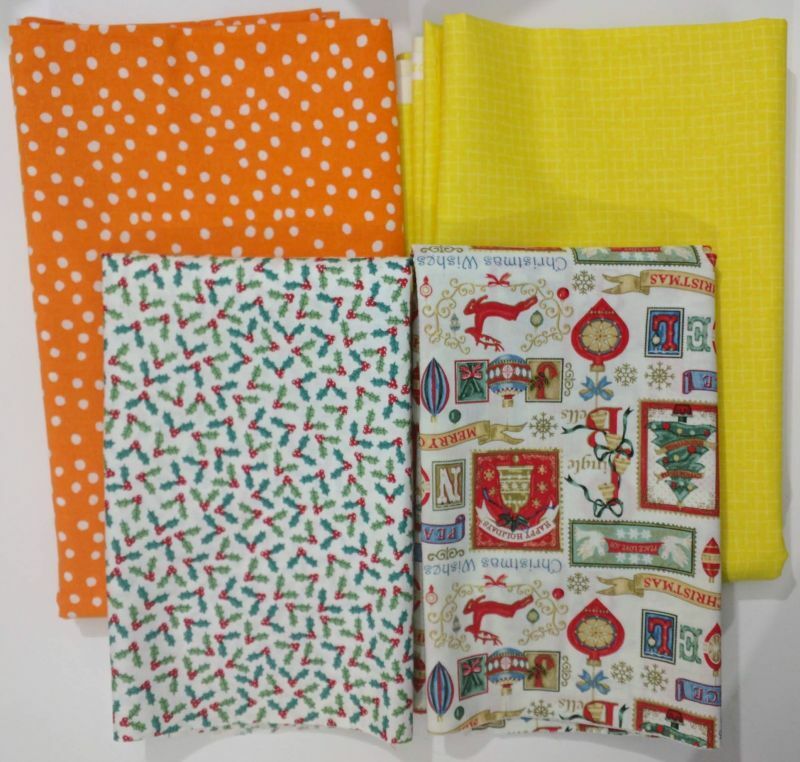 On the way home I stopped by Hobby Lobby where I found the orange, yellow, and Christmas fabrics. After the late night and all day shopping, I was exhausted so there was no quilting. But we still needed groceries, so we hiked back to the cars with empty crates. Our plan was to load the groceries in the crates and toss them out at the curb. Hubby had the groceries in the house by the time I parked and hiked home. 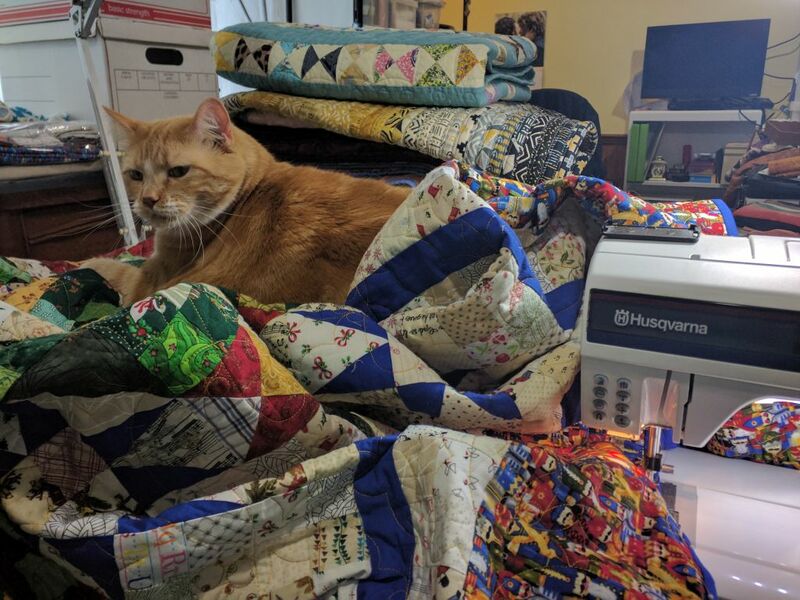 Sunday I headed back to my sister’s and loaded up the quilt. 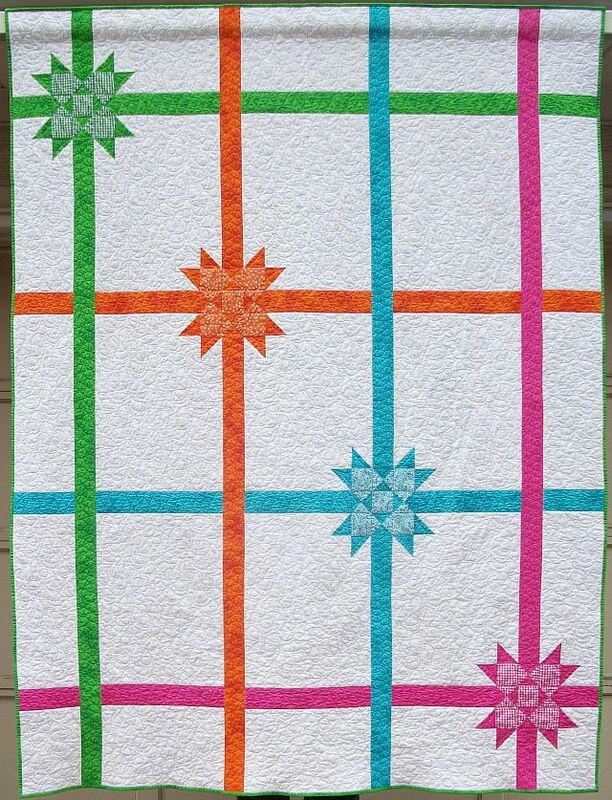 I learned to put in a border on the quilt via the computer and started quilting the squares. Then I ran into issues with the sashing. I figured that out, then the machine made a weird noise – twice. So I shut everything down and started packing up to come home. Then the power went out. Of course it’s still raining – misting really – and the temperature has dropped. Fortunately hubby stood out on the curb so I could stop and unloaded my stuff so I didn’t have to drag it in from the corner. I really hope we can get back in the driveway on Monday, but with the rain, I’m not counting on it.